The 2018 FIFA World Cup is the 21st FIFA World Cup scheduled to take place in Russia from 14 June to 15 July 2018. As one of the most influential events, ranking only second to Olympic, FIFA World Cup is doomed to be the cradle of exciting games and legend and bring football lovers wonderful moments. So there is no surprise football followers hold on to their TV set for every minute of move. The sad news is that nobody can stay sticking to every second on TV without letting a splendid moment slip away. Worse still, blurry video streaming online and frequent loading problem are bothering those infatuated fans. In this case, it is wise to record world cup video to save these heart-stirring World Cup shocking moments, since they not only deserve merely few seconds cheers, but a decade or even longer. To complete the FIFA world cup video record, not only 2010 2014 World Cup, but also the upcoming 2018 FIFA World Cup Russia, MacX Video Converter Pro can make up for the regret of missing the splendid moments. Both FIFA world cup video recording, downloading and converting functions are attached to the software. It provides a hassle-free way to capture World Cup 2018 live streaming videos, highlights, matches and convert them to MP4, AVI, MOV, WMV, FLV, etc for offline playback, editing, sharing etc. No matter you are newbie or experienced user, MacX Video Converter Pro, the best HD video recorder for World Cup 2018 Special will give you the most exceptional experience in recording the live streaming videos of FIFA World Cup with high quality. Follow steps below to give it a shot. 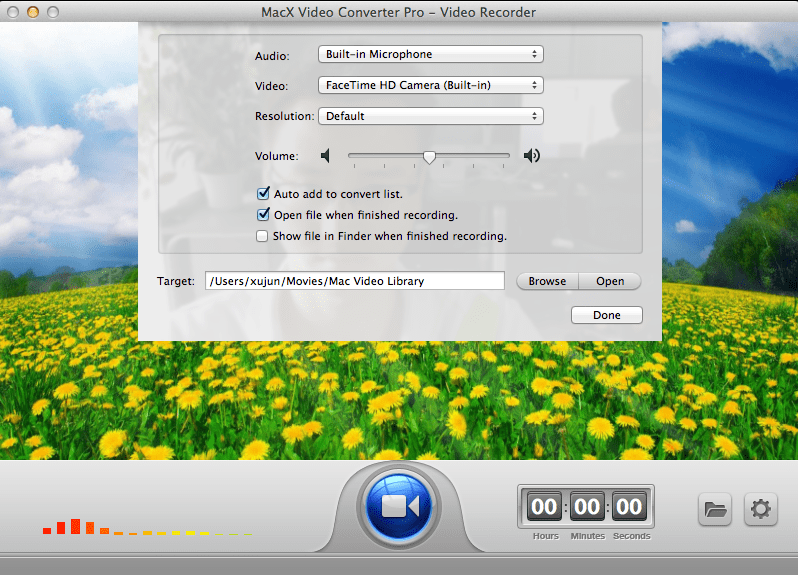 Step 1: After freely downloading and installing this video recorder on macOS or Windows, click the "Screen Recorder" button on the main interface of MacX Video Converter Pro. Step 2: Adjust Capture Settings. It's available for you to choose "Keep Full Screen" or "Crop Region" to customize the capture area, choose the quality of the world cup video, adjust the video frame rate, add sound effect, and more. You can also hit "Add video to convert list" while allows you to convert the video game to other formats for uploading to video website or transferring to your mobile device. Step 3: Choose the Destination folder. Click "Folder" button in output setting area and select a destination folder to save your recording. Step 4: After finishing the steps above, click "Start Record" button to record screen on Mac within a few seconds. You also can stop the video capturing process at any time. Apart from its exception feature to record world cup video, up to 32x converting speed and 359 preset profiles built-in, it is also a professional YouTube downloader and video converter, which is able to download World Cup video for offline watching without loading error and convert the most-viewed world cup videos from YouTube to iPhone X/8/7/6s, iPad Air, Samsung Galaxy S8, Android and more at your fingerprints. Tips: With the World Cup in Russia running in full swing, MacXDVD kicks off the FIFA World Cup deal by giving away this World Cup video recorder. Participants will receive the Worlde Cup gift on conditon that they vote for the team who is likely to be the winner in the Russia World Cup matches. Free download MacX Video Converter Pro, the best video recorder to capture 2018 World Cup Russia streaming video with great quality for offline playback, editing or sharing etc.